Hydraulic Brakes | Cincinnati Precision Machinery, Inc. The new and proven-in-the-field front operated back gauge gives you the opportunity to further increase the already high production capacity of the Roto-Die Hydraulic Bender - the one that handles all the basic metal-forming operations without die changes or any major adjustments. And each Hydraulic Bender is backed by a nationwide dealer network, plus factory support to provide local service and personal training. Other 3 Phase voltages also available. Hydraulic Pressure Gauge, Shut-off Valves, Hydraulic Oil, Wrench & Instruction Manual Included with your Roto-Die Hydraulic Sheet Metal Brake. All Roto-Die Hydraulic Sheet Metal Bending Models are equipped with depth-of-stroke adjustment with indicators, length-of-stroke adjustment, and motor and controls for 230/460 Volts, 3 Phase 60 Hertz. 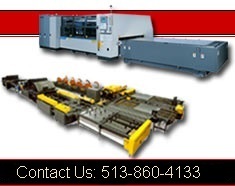 Contact Us About Roto Die Hydraulic Sheet Metal Bending Brakes.